The outer part of the ear, the part that we see, is called the pinna and it channels sound into the ear canal. 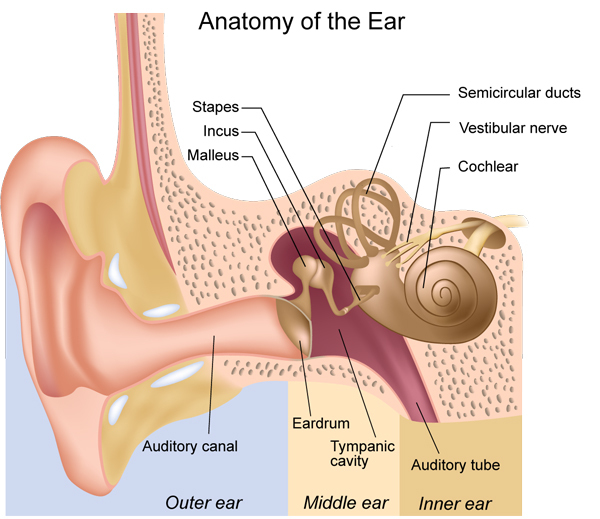 The ear canal directs the sound onto the eardrum, a paper-thin tissue which vibrates as sound waves hit it. The eardrum is attached to three tiny bones in the middle ear cavity. These bones pick up the vibrations from the eardrum and transfer them through the oval window into the fluid-filled cochlea of the inner ear. The vibrations create waves in the cochlea’s fluid. Hair cells in this fluid bend as the waves pass by and make nerve impulses that are carried to the brain for interpretation. One other part of this complex structure is the eustachian tube which extends from the back of the throat to the middle ear. Generally speaking, it opens every time you yawn or swallow, ventilating the middle ear space. It equalizes the air pressure in the middle ear with the pressure around you. Problems with the eustachian tube usually result in conditions that require medical attention.